The figurehead is the one artifact that is equally recognisable to all remaining Old Conways. This is its story. Collisions with the Ship were a perennial problem in the Sloyne. Some were vessels attempting to manoeuvre in the fast flowing, narrow channel, but most were vessels dragging their moorings, often at night. Almost every year one or two vessels would crash into the jib-boom or drag along the Ship’s side destroying boats, railings and rigging. 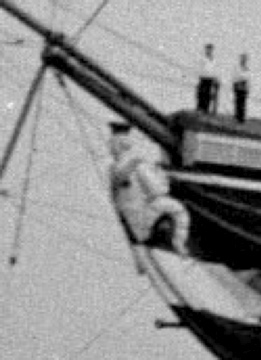 On 4th June1918 SS Bhamo collided with the Ship carrying away the jib-boom and the original figurehead. It was almost 20 years before the figurehead was replaced. 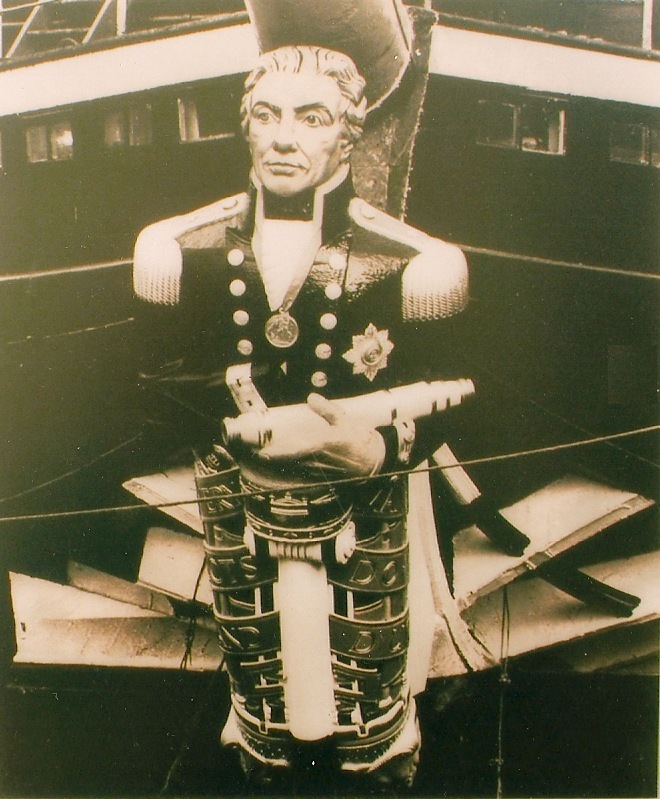 In 1937 it was decided that the ship should have a new figurehead and the figure of Lord Horatio Nelson was chosen. The design and construction were undertaken by Mr. Carter Pearson. 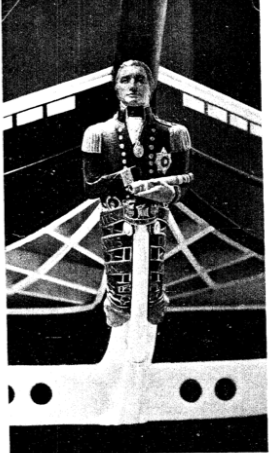 The design, described in the Cadet magazine in April 1938, shows Nelson at the close of his career. He is wearing his most cherished decoration, the Order of the Knight of the Bath on his left breast, and suspended on a ribbon around his neck is one of his medals. He is holding his telescope. Surmounting the cutwater is a moulding of the crown, on the left of this is the Caducean, a symbol of commerce, a pole for ropes and an ornamental boathook. On the right is a trident, symbol of Lord of the Ocean, a pole for ropes and an ornamental oar. The handles of these symbols is bound together with a ribbon on which is inscribed his famous message "England Expects That Every Man Will Do His Duty". The figurehead terminates on either side of the cutwater in a lion's head; the collar is the English rose out of which grows the handles of the symbols. The whole is embellished with rich heraldic colouring and gold. 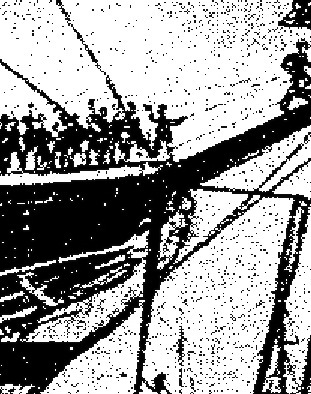 He produced a sketch based on a small model of the figurehead which is reproduced on the left below, along with an image of the masted figurehead. For the masting (fitting to the Ship), dedication and unveiling ceremony the Ship was brought alongside Liverpool Landing Stage, the only occasion of a wooden wall being secured alongside the stage. A series of photos of the masting ceremony are here. Dr. John Masefield OM led the ceremony. At 10.30 am the figurehead was unveiled and Masefield read a poem, ‘The New Figurehead’, he had written specially for the occasion. Seeming to brood above the burst of spray. Long perished are those builders, and that form. And bear alike, unblinking, sun and sleet. And sealed us to the service of the Sea. And Conway boys wherever ships may be. When Conway paid off in 1974 the President of the Club ensured that key artifacts went to appropriate long term homes. The figurehead was donated to HMS Nelson at Portsmouth. IT is still there today and is visible from the main road outside. Photos taken in 1989 and 2008 are here.